WARNING: The actual tutorial is buried within this project. It shouldn't be too difficult to pull out the key points if you're planning on trying this at home. 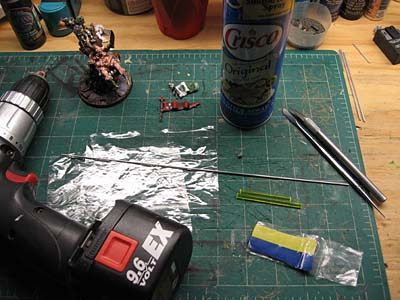 Warpstone Flux is painting his own Epidemius model right now, so I figured I would get this reposted to help him a little bit if he finds himself in a similar situation. This is what I started with. One completed Epidemius model... minus two broken banners. The plan was to make two new banner poles and attach them to the model and then sculpt two new greenstuff banners and add them to the new poles. 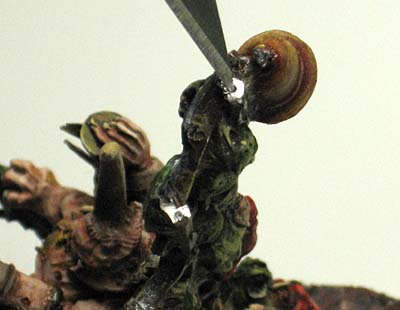 Throw on a few "nurgly" elements for stability and I'd be good to go. The problem (aside from the owner throwing the model on the floor) was that everytime he bumped one of the banners during game play... they broke off because their attachment points are incredibly weak. I gathered up a few things and got to work. I've never made greenstuff banners before but I saw a tutorial once and I figured how hard could it be. Besides, it wasn't my model so what could go wrong? First thing to do was clean up the attachment points and see just what I had to work with. 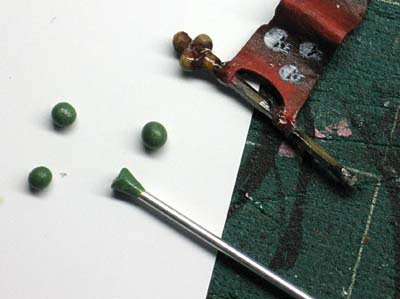 After I realised I had plenty of room to drill them out so I could insert the new banner poles, I made a small pilot hole in each one with the tip of my X-Acto blade so my drill bit wouldn't skip around while I was drilling. 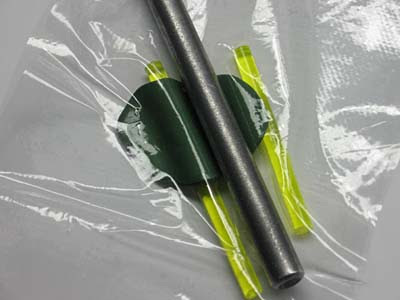 Here are the "new" attachment points. I drilled down just over a quarter inch (4 to 5mm maybe for you guys across the pond). 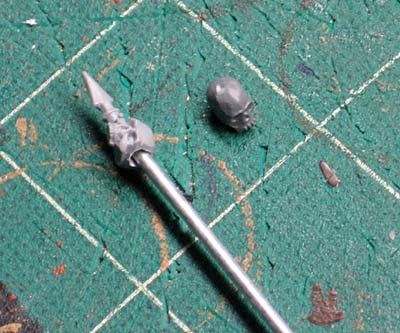 Real quick, I duplicated the top of one banner pole with some greenstuff pieces and the other with a skull from some random Chaos bit. I just drilled out the underside of the skull so it would sit on top of the pole. Then it was onto actually making the banners. 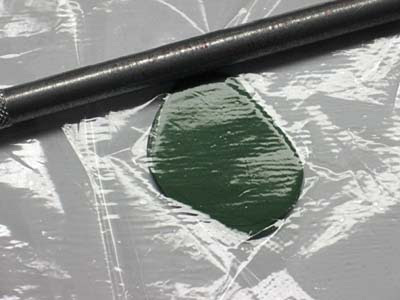 I'll always cut out the middle of my greenstuff before mixing it. It gets rid of the portion that has started to harden where the two colors meet. I go with a 50/50 mix of blue and yellow. I know there are pros and cons of mixing differently but I've never gotten into that. I'm not that good with greenstuff that I need to alter my mixing ratios to achieve certain results. Now I've seen this done before but I don't remember exactly how it was done. That combined with being too lazy to spend an hour or better hunting for the original tutorial, I decided to go it on my own. 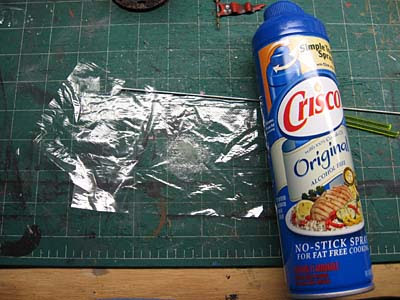 I grabbed some oil based cooking spray, a couple of zip-lock bags and a few pieces of tubular stock. 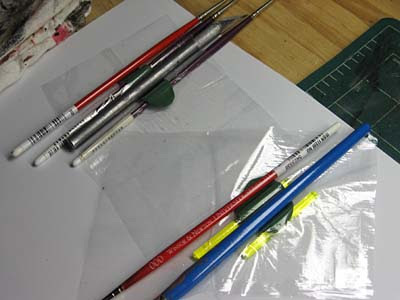 I cut the plastic bags up so I had a handful of small plastic sheets that I could put the greenstuff between. I sprayed a small amount of the cooking spray on the insides of the sheets so the greenstuff wouldn't stick when I put it between them. 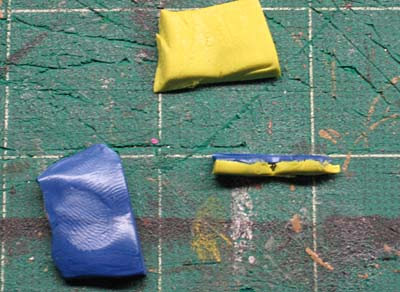 The basic idea is this, you mix up your greenstuff and then roll it out flat between the two sheets of plastic (that are coated so the GS doesn't stick). I got it to the thickness I wanted by using my X-Acto knife handle like a rolling pin. I had to lay the GS on a super smooth surface so it didn't pick up any texture while I was rolling it out. Once I had it rolled out to the correct size (bigger than I wanted because I planned to cut out the real shape once it dried) I used some tubular stock and draped the greenstuff over it to dry. I had to lay something on top too to keep the overall shape and I went back every few minutes to check on it because it wanted to straighten out while it was curing. Here are both of them set aside to cure completely overnight. Then I needed to make a small bit for the bell that's on the model. The original model has a bell hanging from a chain from one of the banner poles. 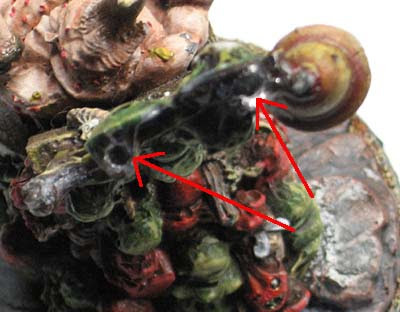 I'm not sculpting chain, simple as that. 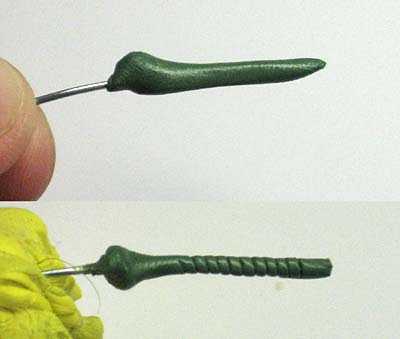 But I can sculpt rope fairly easily. I made another pilot hole in the top of the bell and then took some greenstuff and wrapped a thin wire. Then I took my X-Acto knife and cut in the texture of the twisted rope. More on this piece in Part 2. One last thing to do was to make a few elements that I would use to shore up the whole thing once it was built. 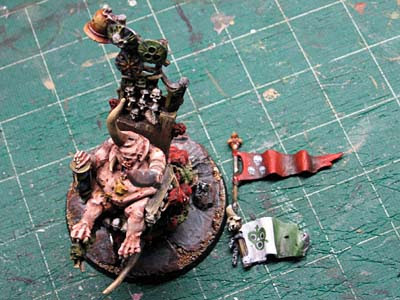 One was a nurgle-type disc that I copied from lower down on the banner poles and the yellow pieces are cross members that will connect each banner pole. The model has these lower down and I thought I would continue them up to the top for stability as well. They are made from plasticard. I took 3 thin pieces and glued them together to get the same thickness as the bars on the model. Then I shaved them down to appropriate sizes and took my X-Acto knife and cut grooves into them to simulate wood grain. And there it is, most of the pieces that I need to build the model's banners. Part 2 shows all of it coming together. Thanks for posting this Ron! Much appreciated mate! Great so far, I look forward to part 2! jabberjabber: No problem, I started work on it the other week and got sidetracked with other things, but when I saw your post... I went back and finished this part up. The Inner Geek: I've just about got Part 2 reformatted now, it's not much more info, it's just the coding and making sure all the links are correct. That's the coolest! I am so excited for the other part. Thank you for sharing this with us. I'ma try this out on my own. I'd let you know the result. Thanks a lot! Banners: Good deal, hope it works out and you're able to build what you want. That's one genius decal. It's great that you're generous enough to share this stuffs with your readers.